Transmit your blithesome wishes on a birthday of an endeared one with this Exotic Bouquet of Delicate Blossoms and leave a profoundly pleasing mark in the individual's heart. 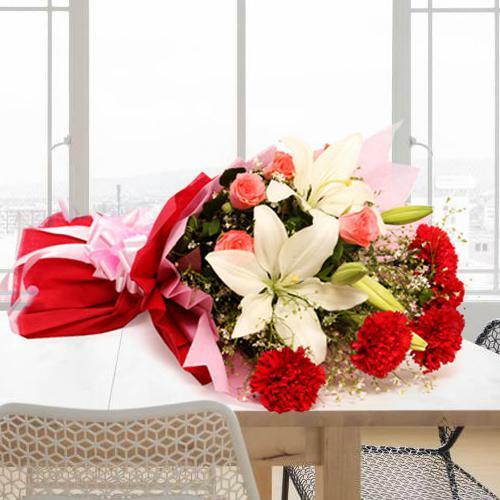 Refreshing Blossoms such as Red Carnations (5), White Lilies (2) and Red Roses (4) are presented in this Bouquet. Wondrous gaiety gets delivered to the life of a couple you esteem when your this souvenir of admiration--- the Cheering Bouquet of Appealing Flowers reaches their doorstep. This Bouquet features magical Flowers like 4 Red Roses, 5 Red Carnations and 2 White Lilies with 16 pcs Ferrero Rocher.